I love a burger I really do, for the longest time they were the fussy eaters get out of jail card on every restaurant menu. Cooked to the potion of cremation with some plastic cheese they just were not getting the the love they deserve. Roll on 2012 and in our fair city we have an abundance of bars and restaurants that actually only serve burgers and others who take great pride in them being a headline act on their menu. With gastro pubs like the Fountain on funnily enough Fountainbridge, burgers are enjoying now being given the care and the attention they deserve. I still get a flutter of excitement every time I am asked whether I would like my burger medium to rare. As the foodie evolution continues I think this just shows how demanding the diner in our fair city now is, go to the Cambridge Bar just off Charlotte Square and they have more than 15 topping choices than can go with either a beef, chicken or bean burger. Fair to say a burger alone won't leave you hungry and with guest burgers and now a venison option as well this is one example of a bar where the burger is King. Another bastion of the burger is the New York Steam Packet, in what must be one of Edinburghs longest running restaurants after 40 years of continual service they offer an American diner experience. 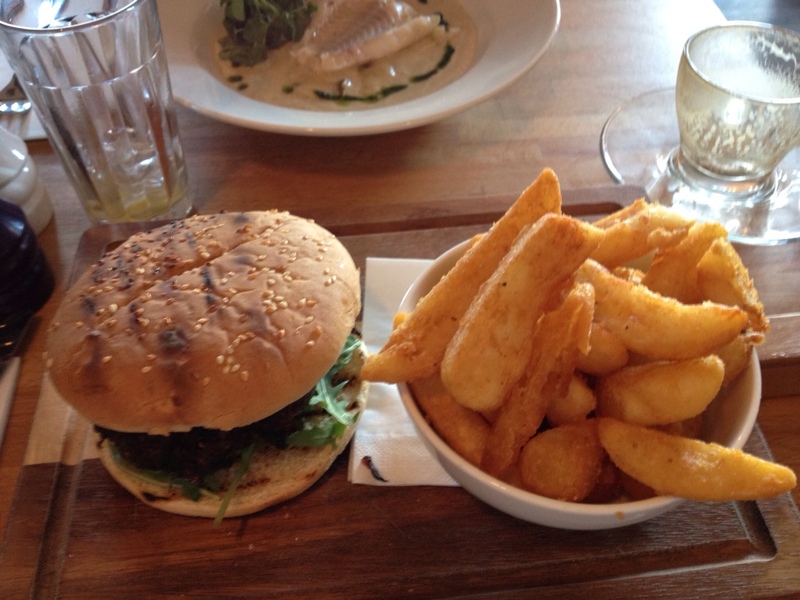 The burgers are big, cooked to just off medium and served with their best friend chips. In the year that was 2012 I don't think any food blog on burgers in this city could be complete without paying homage to Burgher Burger. This pop up restaurant enterprise enlisted some of the cities best chefs to conjure up their own burgher creations at a secret location on Leith for the pleasure of some lucky diners, the best concept in my opinion came from head chef of he Plummed Horse, Tony Borthwick. He combined Veal, spring truffle and fois gras for what sounded like an incredible burgher moment. 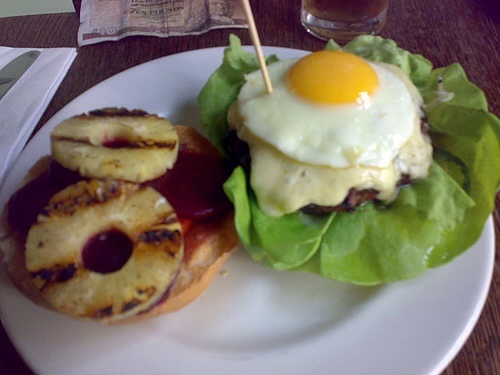 So now that you obviously need to go and eat a burger check out my top5 recommended burger joints in our city :). 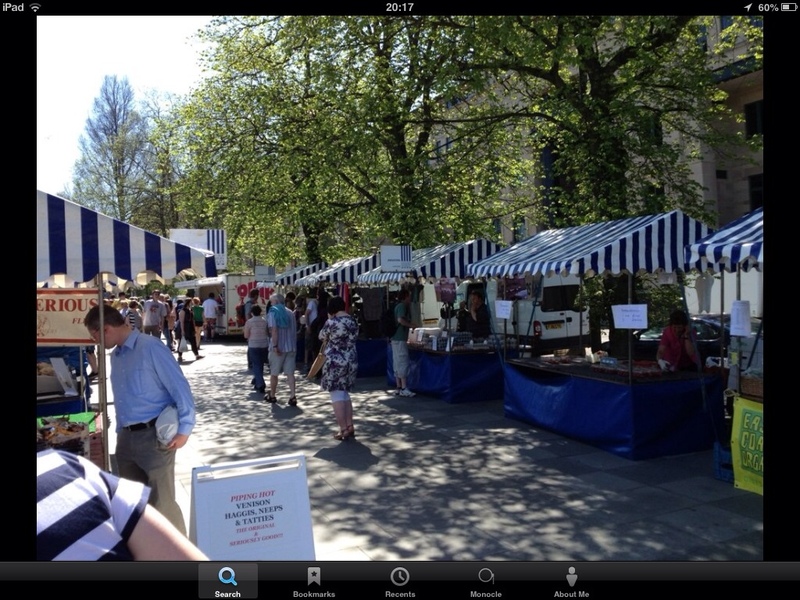 So logically in a recession you would think people would spend less money on luxury items and be economical, at first thought that would them mean the likes of farmers markets should be under threat. Well that's what I thought anyway. 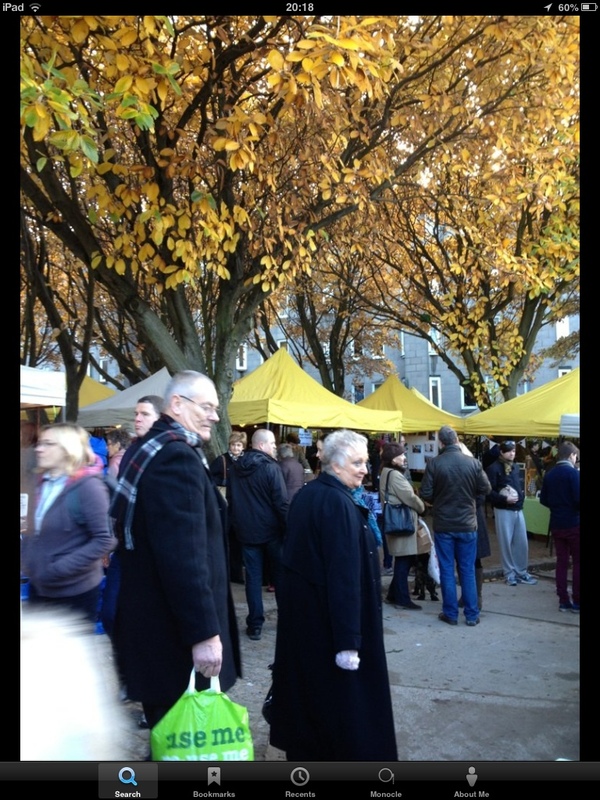 Edinburgh is now served every weekend by two great markets, on a Saturday at Castle Terrace and on a Sunday in Stockbridge. As a lover of all things food my weekend invariably means visiting one if not both of them. In the last four years these markets have gone from being one a month, twice a month to where they are now as weekly bustling events. So the secret of their success and the secret many people have still to catch onto……..locally sourced produce direct from farmers is better and cheaper than anything you will get in a supermarket. Take lamb shanks for example, in Tesco they are £7 for 2. At either of the markets you could have better quality meat at 2 shanks for £5 or even a rack of lamb for £7. The other real secret is the wonderful producers, their knowledge and passion is there for anyone to see. They gleefully talk to customers, give them recipe ideas and pass on their enthusiasm for the whole process. Stand outs for me personally would be Peelham Farm, Puddledub Pork & Buffalo, Arran Cheese, Creelers, the fish and game stall at Stockbridge who's name I can't remember :)! So if you are looking to try a grouse, pigeon, duck, lobster get to the markets and get talking to these gret producers! So it's really one day 1 of my blog and I have had my first request for an article by the lovely Jorji. Where can you get Michelin quality food without having to get out the credit card and close your eyes when the bill comes. Edinburgh has a wealth of bistros who delivery fantastic taste without the need to break the bank. My favourite such place would have to be Iris on Thistle Street. 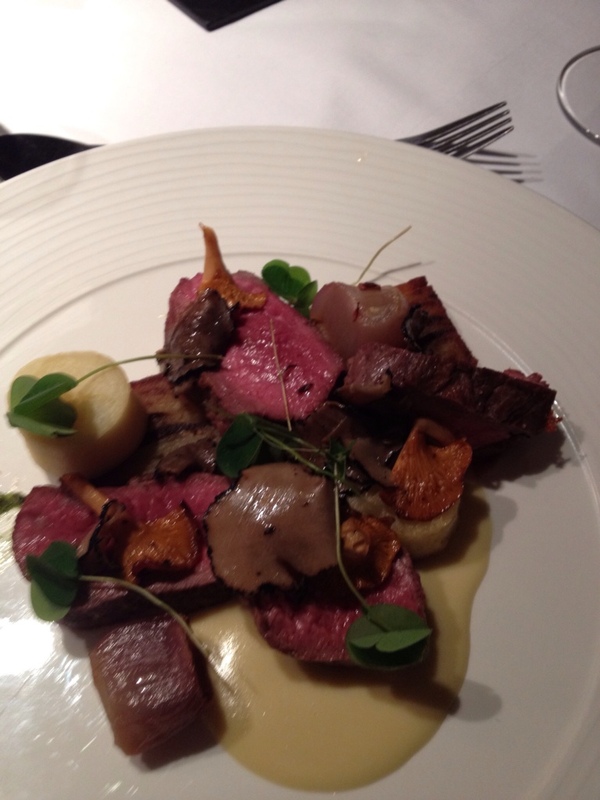 Described as modern Scottish they use great local produce and create some great dishes. 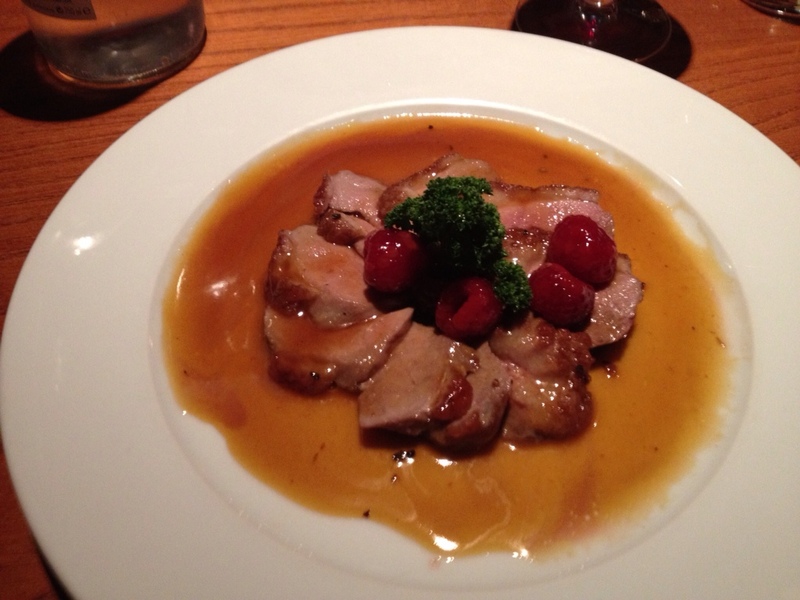 The chefs signature dish is duck with raspberry and drambuie sauce. I love this dish, it's beautiful. Great colour, style and importantly taste. You will also find a blend of European dishes and British classics all given the Iris makeover. 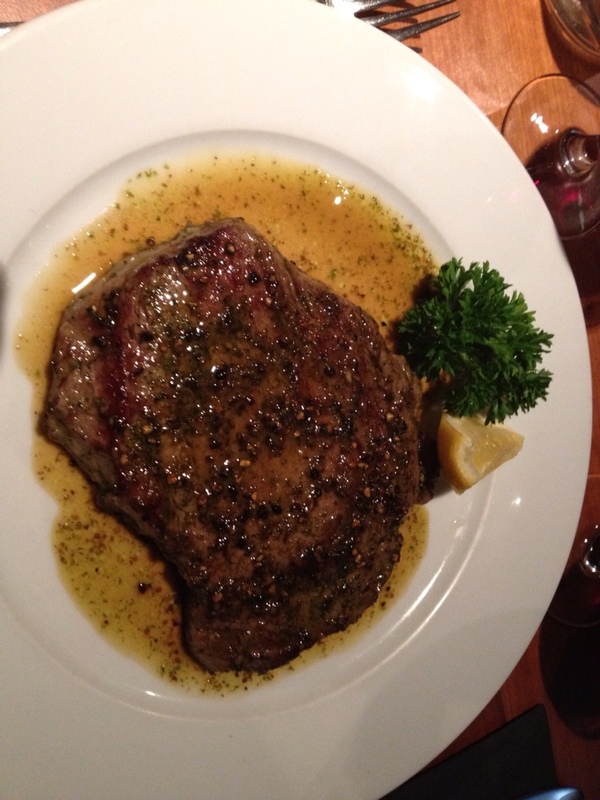 Take steak for example, great cuts – cooked well that are visually brilliant. Iris has another ace in the sleeve, that is the service. The staff are so friendly and very knowledgable about the menu. They are all well drilled on the wine list which is also excellent and more than able to suggest a nice bottle to have with you meal. Top JD recommended option. To have Michelin styled food then sushi restaurants are a great option, the visual beauty is always there and to get the taste as well I would suggest Kanpai on Grindlay Street. 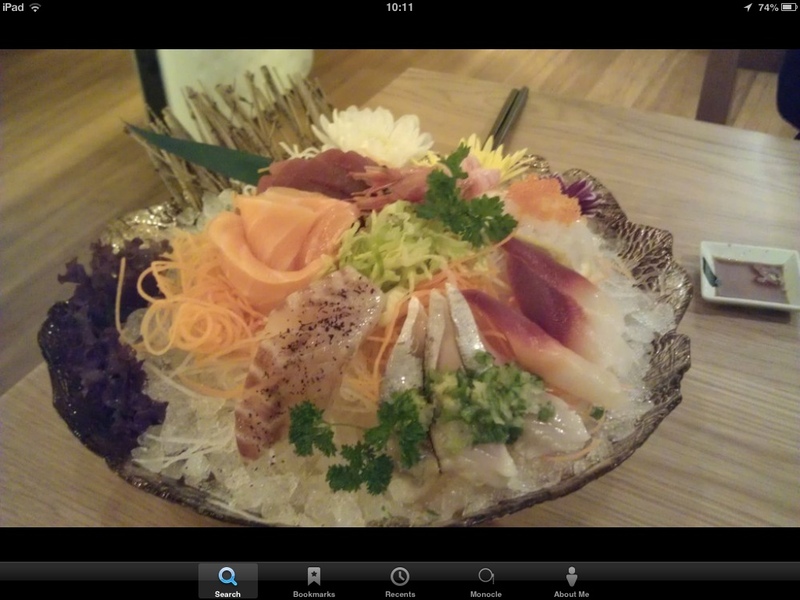 With a wide selection they cover not just sushi but all aspects of Japanese cuisine. Personal favourites for me are the miso seared tuna, the soft shell crab and the sashimi platter below. 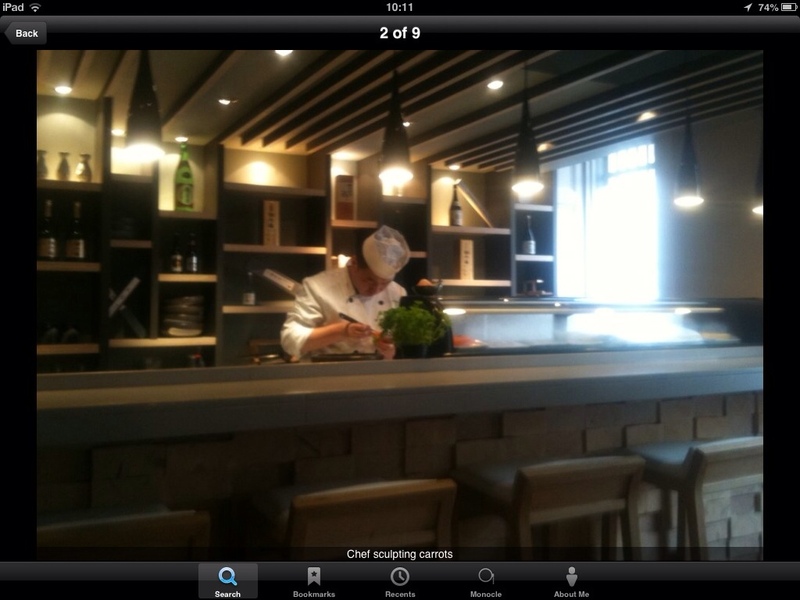 Kanpai is a leading light in the growing Edinburgh sushi scene and with all palates catered for this is a gat restaurant for sushi lovers and novices alike. There are always going to be mixed opinions when it comes to restaurants as well we all have our own tastes as so naturally our own opinions, few places are more universally adored by foodies I know than Mark Greenaways restaurant. Over the last 2 years at 12 Picardy Place he has carved out a name as one the cities hottest placed to eat. As he grows in fame via his food and tv appearances on the Great British Menu I was excited to hear he will soon be taking up residence in a larger establishment. So what makes it so good you ask? Well first of all it's the staff, from the receptionist, to the hostess, the waiting staff and the sommelier the service is 1st class. In terms of value for value his market menu, 3 courses for £20 before 7pm has to be one of he best value meals in the city. 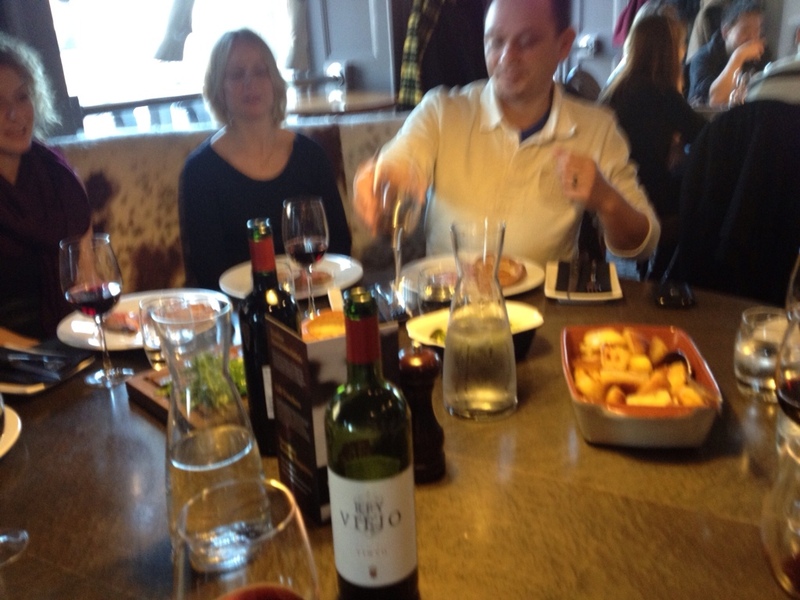 With wine flight options carefully selected by Loic the sommelier it's a great dining experience. Go more than once and this young sommelier will even go to extent of considering what he served you previously to ensure you are given something new to wash down your meal with. Having eaten from the a la carte as well as the tasting menu what really strikes you is the use of modern and classic techniques intertwined to deliver the biggest flavours. The above dish was a stunning rework of a Scottish breakfast, hot smoked salmon, black pudding Bellini and fois gras with a foam. 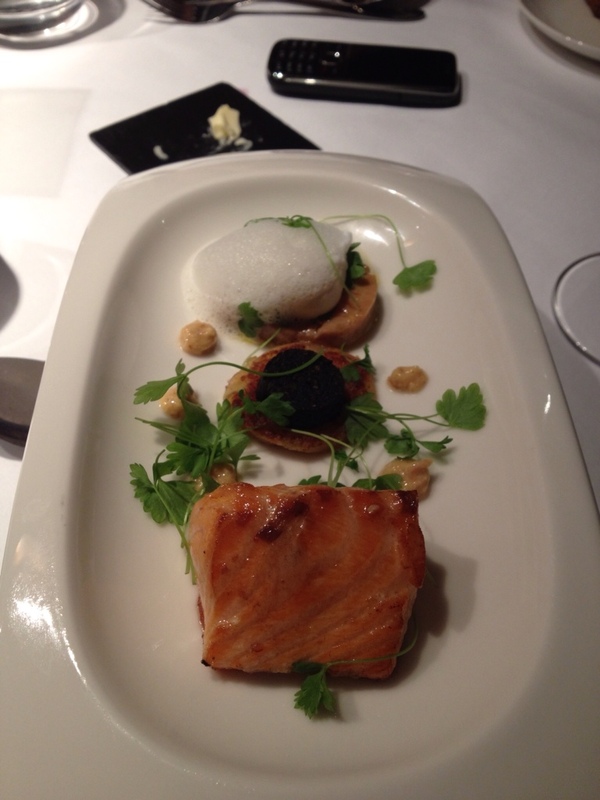 Light starter with bags of flavour and visually stunning. 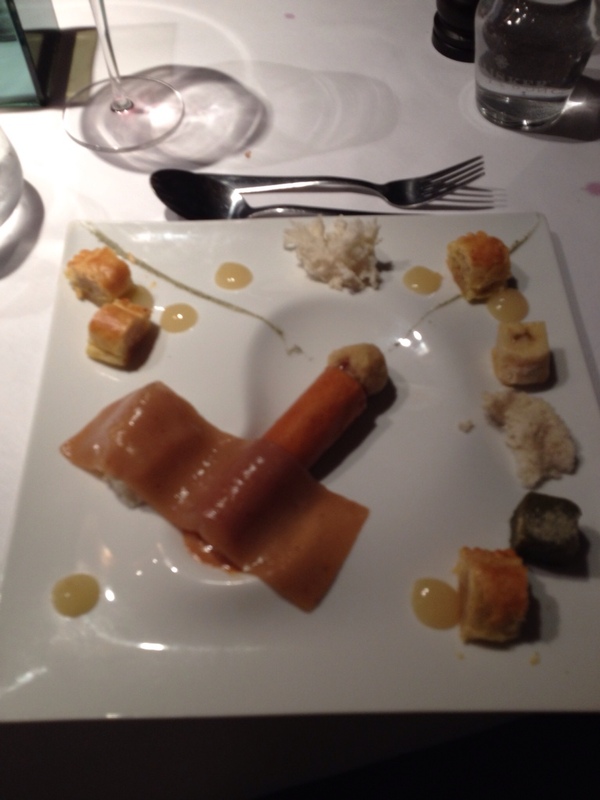 Deconstructed banoffee, so many flavours, so many textures…… Delicious. So for me Mark has really set a new standard for the new comers to the Edinburgh restaurant scene and done it in style. I love his food and his restaurant and look forward to much more in the future. By 2014 I will be amazed if he has joined ten elite Michelin star club. Last Sunday Steph and I both awoke with throbbing heads but safe in the knowledge that Jenny L, the Edinburgh Community manager for Yelp had organised a great deal for us at Kyloe. The emergence of steak restaurants in Edinburgh has heightened competition in the city with Kyloe and Steak Edinburgh being the big dogs to date. Kyloe has launched a fantastic Sunday roast option, 4 people, roast joint of your choosing, all the trimmings, a desert and a bottle of wine for £100. You do have to preorder, no last minute decisions unfortunately but it is a great idea. 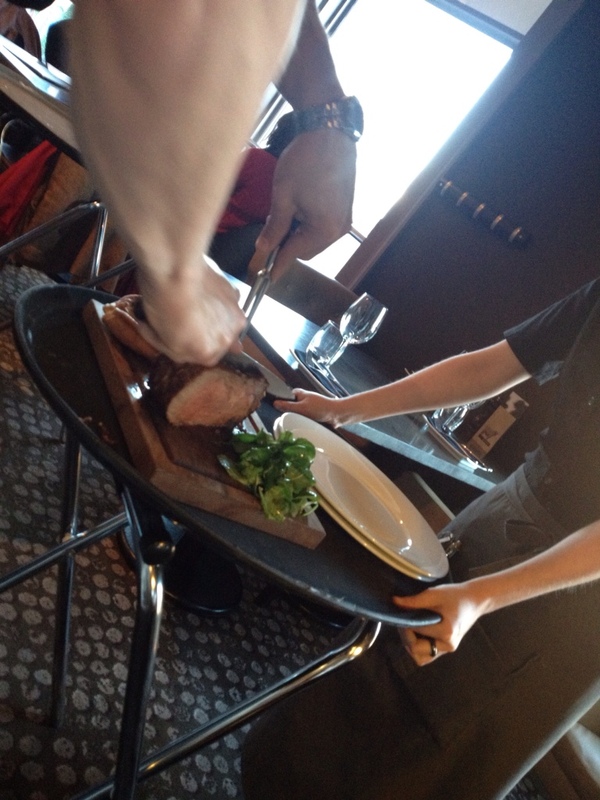 The joint is brought to the table and carved in front of you, served with a large Yorkshire pudding. Cooked to medium the meat is of fantastic quality. The portions are huge and you need four very hungry mouths to get near to finishing the lot. Deserts are homemade classics, on our visit it was apple crumble served with cream, we asked for ice cream additionally and this was no issue. I need my vanilla ice cream when having crumble, surely it's a law somewhere? In any case the meal was superb and a visit come highly Jd Reommended! I was gutted when Tony Singh announced he was closing Olorosso, for 10 years it was a beacon of good food in the city. The views, the food and the service made for a great restaurant. But as cities have a habit of doing we soon move on and in the place has come Chaophraya, they are on Twitter @ChaophrayaEdi. Steph and I love a walk in town after the farmers market on a Saturday and decided to try this place for lunch. There is something grand about having to get an elevator to a restaurant and then the stunning staircase makes for a beautiful setting. 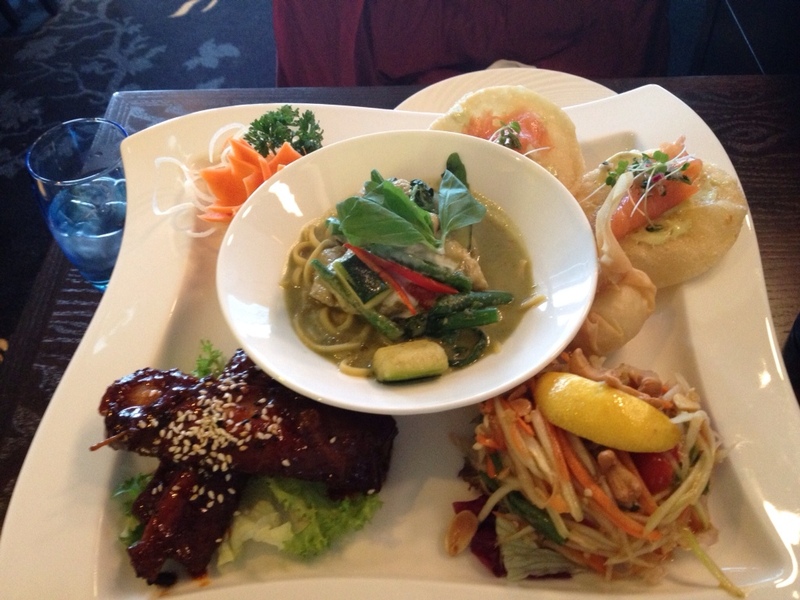 They have lunch and a la carte menus giving plenty of choice but for our lunch we opted for their house mixed platter. This came with smoked salmon tacos, a chicken curry, papaya salad and Thai ribs. At a very reasonable £10.95 this was perfect. The balance of spice, fragrance and sweetness was well managed and we both left wanting for more. We will be back and this place comes highly Jd Recommended!